Duck Lake is located in Calhoun County, ten miles north of Albion in Clarence Township. It has been a popular resort lake for many years. Duck Lake once had its own post office in the late 19th century, and a small community was located on the north side of the lake. The Duck Lake drain forms the headquarters of the Battle Creek River. Today, Duck Lake is serviced by the Albion, Springport, and Olivet post offices. Duck Lake was also the retirement home of James "Deacon" McGuire (1863-1936), celebrated Detroit Tigers catcher who moved here from Albion in 1924 and lived here until his death. McGuire along with his brother George issued several "GOOD FOR" tokens from their "McGuire Brothers" Saloon in Albion in the early 1900s. The Duck Lake Boat Office was located on the north shore right near the drain, on the site where the Silver Beach Resort now sits. There was a boat livery with 22 slips. A long and permanent pier stretched into the lake. It was constructed with large timbers, filled with large rocks. The pier rotted out and was removed around 1915. At one time a steamboat, the O.K. Sackett, took passengers for rides around the lake. The Office operated in the 1890s and early 1900s, and was owned by William H. and Betsey (Munroe) Leonard. William was a postmaster at Duck Lake for fifteen years, and also operated a sawmill here. The Boat Office building was 20 x 30 feet with a wide porch on two sides. Soda pop and candy were sold and it was said that if you were known well enough, you could get a "sassparilla," which was a shot of whiskey. Adjacent to the Boat Office was a campgrounds operated by the Leonards. 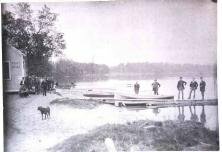 The July 27, 1894 edition of the Springport Signal stated, "Mr. William Leonard, who has charge of the camping grounds at the north end of Duck Lake, is equipped to handle his many visitors in the best of style this seasons. Among the many improvements is an excellent new outfit of boats. He has accommodation for 60 horses and carriages, in case of a storm. He carries a fine line of fishing tackle and bait in season Meals on short notice and soft drinks, candy, nuts, cigars, tobacco and cigarettes at the stand. Where can you spend a more pleasant day than at this popular resort? The campgrounds are free and no exorbitant rates are charged." Lake ice could also be purchased here by the chunk, in the days before electricity and refrigerators were installed. Ice was cut from the lake, and stored in an ice house, the ice being covered with marsh hay and sawdust. After the death of William and Betsey Leonard, the business was continued by Arthur and Amarilla Stark. When electricity came in 1928, the Starks moved the old Boat Office building towards the Duck Lake drain, and converted it into a rental cottage. A new boat office was constructed on the original site, which is now known as the Silver Beach Resort. The original Boat Office building was acquired by David A. Garfield in 1940, who built an addition onto it, and moved into it in 1950. He lives there today, at 552 North Shore Drive. Mr. Garfield supplied this author with information about the Boat Office. The original owner, Betsey (Monroe) Leonard, was his great-aunt, and Amarilla Stark his cousin. The token, front and back, issued at Duck Lake. Issued by the Duck Lake Boat Office was an aluminum token, 26 mm. in diameter. The obverse reads, "AT DUCK LAKE BOAT OFFICE," with the reverse stating, "GOOD FOR 5¢ IN TRADE." There is a small hole in the center. Illustrated here is the token, and an early photograph showing the Boat Office on the far left, with the lake and boat livery on the right. A dog walks in the sand in the foreground. The History of Clarence Township: Then and Now, by the Clarence Township Historical Society (1994). Duck Lake Boat Office," Morning Star, 26 December 1993, pg. 1. Advertisement, Springport Signal, 27 July, 1894.